A child’s precious early years should be spent in a welcoming and nurturing environment – a place where he or she can learn age-appropriate curriculum and grow in faith. At our Early Childhood Center (ECC), we strive to achieve exemplary student instruction for children as young as three years old. With Jesus at the core of all we do, children develop a lifelong love for learning and a strong desire to follow in His footsteps. Our 3K program teaches little ones fundamental social skills and basic truths about Jesus. In this replay-based environment, three-year-olds learn how to interact with their peers while having fun and acquiring new knowledge. To demonstrate equality and school unity, all students at the ECC wear uniforms. In addition, every student receives a nutritious lunch and optional breakfast each day. Menus are posted monthly on this site. Children in the 3K program must be at least three years old and fully potty-trained. If you would like to register your child for preschool, please fill out the enrollment forms and return them to the Center along with your $35 non-refundable registration fee. We offer monthly payments for tuition that can be covered privately or by the State Child Care Assistance program. Child Care Assistance information should also be submitted with your registration. The Early Childhood Center is also home to our Before and After School Care program. Serving all Atonement students through 12 years of age, this state-licensed program provides a safe and comfortable environment for children before and after school. Accommodating parents’ busy schedules, Before Care begins at 7 am and After Care ends at 5:30 pm, Monday through Friday during the school year. 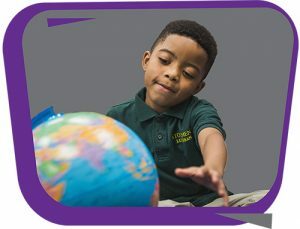 The Before/After School program offers numerous teacher-facilitated activities and important homework help. Students have access to whatever resources they need to excel in their academia. An after-school snack is also provided. The Early Childhood Development Center is located on the Atonement Lutheran School campus.